Antibodies and cancer. 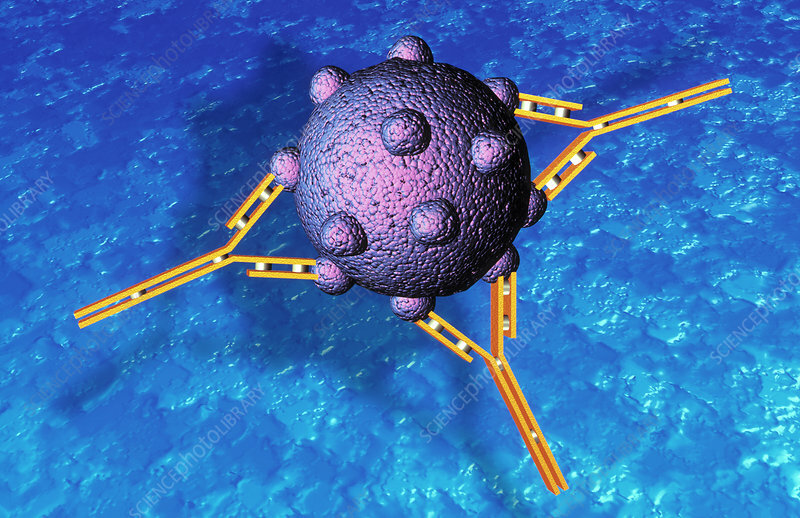 Computer illustration of antibodies (orange) attacking a cancer cell. The Y-shaped antibodies (immunoglobulins) are proteins produced by B-lymphocyte white blood cells during an immune response. They bind to antigens (purple) on the surface of "foreign" invaders or abnormally-shaped body cells such as cancer cells. Bound cells are more easily digested by macrophage white blood cells. The bound antibodies also trigger proteins from the immune system's complement system. These proteins cut holes in the cell membrane of the bound cell, causing it to disintegrate.